BOM – Blood Orange Marmalade. 1/5. Got these blood oranges from Schletewitz at the Heart of the City Farmers’ Market. KJAL – Kiwi Jalapeño Jam. 1/10, 1/13. The Kiwis are from Glenn Tanimoto at the Heart of the City Farmers’ Market. The 13 Jan batch has a very gentle Jalapeño flavor, but the 10 Jan one is certainly not hot. Pickled Herring. 1/13. Same Swedish recipe that i used last year since everybody liked it. I took jars of it to Ruth and Ellyn a few days later and was telling the folks there about the herring worm issue, mentioning that the worms sicken about ten people in the US every year, which makes you three thousand times as likely to die of an auto accident or a gunshot wound than be merely sickened by herring. My friend Rina (the American Rina) nailed my logical fallacy there by pointing out that Americans spend far more time riding in automobiles than they do eating pickled herring. Good point, Rina, although i would guess that we probably spend little more time killing each other with guns than we do gobbling raw herring. I mean, it takes much longer to chew a bite of herring than to pull a trigger. More importantly, i insist that i wasn’t intentionally trying to deceive anyone, nor is it quite on the same level as the Roman Catholic church paying for political advertising claiming that if Prop 8 were not passed, American clergy would be forced to preside over gay marriages, which was a flat lie since Prop 8 would merely have permitted gay marriages and they knew it but were intentionally lying. In any case, i’m admitting my false logic here and patiently waiting for His Drunken Grace to admit his lies. Oh wait. Wasn’t this about herring? RLM – Rangpur Lime Marmalam. 3/11. Carol’s poor little Rangpur lime tree produced a pitiful crop this year, but she managed to get five pounds of them for me, which was enough for a full batch. Demand your jar now, as there won’t be enough to go around. Oh, and maybe we should all start doing our Rangpur lime dance so as to ensure a better crop next year. Pickled Snow Peas with Fresh Green Garlic. 3/18, 3/28, 4/6, 4/20, 4/30. Ummm, yes, an experiment. The garlic is a bit chewy, but even with my failing dentition it’s still OK and has an excellent flavor since it’s not as pungent as full grown garlic cloves. Snow peas are wonderful pickled, and i wish i’d thought of doing this years ago. I get the peas from the Herrs at the Noe Valley Farmers’ Market and used a little slice of red onion, some black mustard seed and two or three little dried chiles Pequin in each jar, but the chiles are so mild that i should have used more. For the second batch i used a dab of pickled Jalapeño to brighten them up, white mustard seed, and cut the pickling solution back to 2/1 water/vinegar with one T salt per three cups liquid. Oh, and only one stalk of garlic per jar. I keep making more of this because everybody’s liking them. Oh, and i finally started throwing in some dill seed. In the 4/20 and 4/30 batches i put one dried Ahi chile in each jar. Those things are so hot that one should be quite enough. Well, except for the Herrs and the Yerenas. For them i stuck in three. Jay Herr broke into a grin when he sampled one from his jar, which means that a normal person would be flopping around on the ground screaming for an ambulance. Pickled Sugar Snaps with Fresh Green Garlic. 4/4, 5/5, 6/1. Yes, the snow peas were so well received that i went ahead and did a batch of sugar snaps with red onion, fresh green garlic, and a dab of Jalapeño. And then second and third batches with a dried Ahi chile. 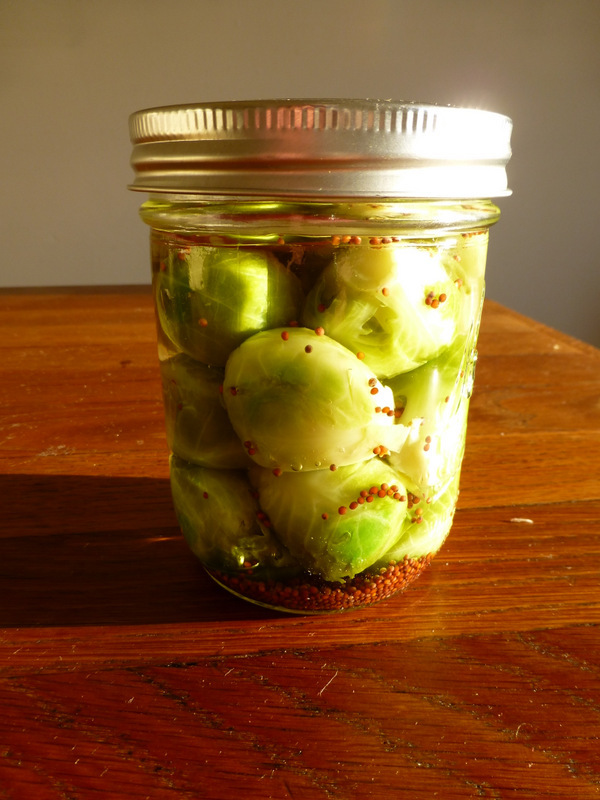 Pickled Brussels Sprouts with Fresh Green Garlic. 4/5, 4/23, 5/10. As long as the fresh garlic season holds out, i’m pickling. The pickled Brussels sprouts have always been one of those love-’em-or-hate-’em things, but there are enough lovers that i’m doing some this year. I got them this morning from Iacopi at the Ferry Plaza Farmers’ Market, and he has the finest sprouts on the planet. Knows it and prices them accordingly. Shoulda taken a pic of the first batch before i prepped ’em as they were so fine they hardly needed prepping. I stuck a dried Ahi chile in each jar of the 4/23 batch to brighten them up. SL – Strawberry Jam. 4/11, 4/18. Nothing exotic here, just plain old strawberry jam like grandmother used to make. Pickled Yellow Snow Peas. 4/19. Yep, a new product from the Herrs, yellow snow peas. Cute, and to cut the cuteness i stuck a dried Ahi chile in each jar along with green garlic, dill seed, mustard seed, and a dab of alum to crisp them up. Those chiles are hot, so some some folks may want to fish the chile out upon opening the jar to keep the peas from getting hotter and hotter. AAL – Apricot Jam. 5/6. Schletewitz had his apricots in today at the Heart of the City Farmers’ Market, so i grabbed four pounds and made jam. To brighten it up i added a level teaspoon of New Mexico chile powder and just nailed it. You can barely taste the chile at first but get a mild warm glow afterwards. Blueberry Jam. 5/8. I stuck a couple of quarts of blueberries, the juice of a lemon, a shredded apple, and two cups of sugar into my slow cooker at nine this morning, and at nine tonight all i got was seven miserable little jars out of the greatly reduced contents of the cooker. An interesting recipe, not that i followed it all that closely, but a good website. The jam? Well yes, tastes good with a highly concentrated blueberry flavor, but i’m not real wild about blueberries and it was very expensive so won’t be doing this again. The jars go to the first seven people who ask for them. Act now. 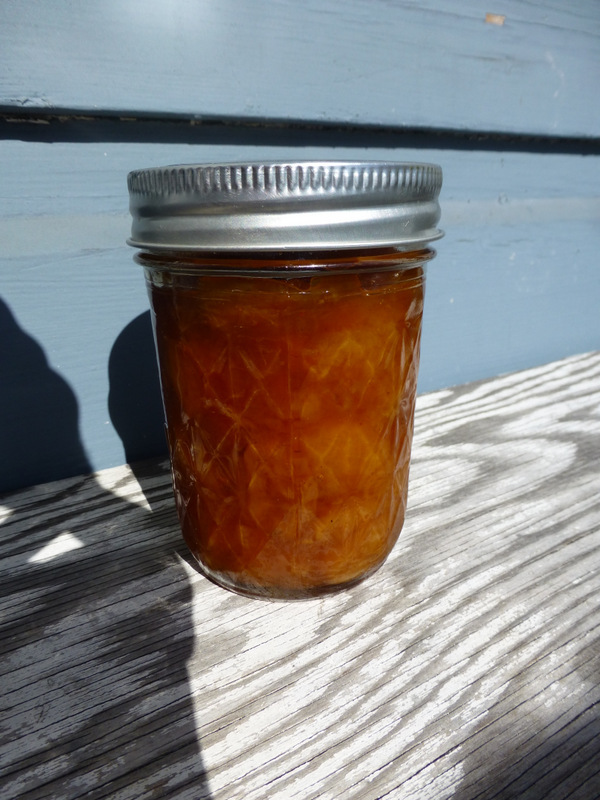 NALC – Nectarine Jam. 5/10. My fave nectarine vendor at the Noe Valley Farmers’ Market had really fine yellow nectarines today, so i got four pounds and made jam. Added a rounded teaspoon of that New Mexico chile powder, which took it to the point that you can taste the chile without it being really “hot”. CC – Cherry Chutney. 5/14. The Hamadas did not have a good cherry crop this year, but i snagged four pounds of their Brooks cherries yesterday and made a chutney of them today. Since i had no fresh chiles, i added a couple of heaping spoons of Indian hot lime relish and two rounded teaspoons of New Mexico chile powder, which cranked it up to fairly hot. Not for the kiddies. RAL – Raspberry Jelly. 5/14. Plain old unadulterated raspberry jelly. Fine for the kids….and anyone who’s made nervous by all my exotic additions. RCAL – Ranier Cherry Jam. 5/17. There were gorgeous Ranier cherries at the market Heart of the City Farmers’ Market on Wednesday morning, and i grabbed four pounds. Left out the peppers and other strange ingredients, so this one’s just a plain cherry jam. Well…with Ranier cherries. CAL – Cherry Jam. 5/18. This morning Alfieri (at the Heart of the City Farmers’ Market) had a cherry variety with which i was unfamiliar, Garnett, and they are delicious. Much better than the Brooks variety this year, so i made a plain cherry jam of them. TCAL – Black Tartarian Cherry Jam. 5/22. Yow! Yesterday i was at the Heart of the City Farmers’ Market and stopped by Alfieri to pick up some of their superb almond butter that they packaged in 8 oz. jars especially for fans like me, and as i was about to buy more of those Garnett cherries, i noticed out of the corner of my eye a small bin of some very dark cherries. My heart leaped up, and yes, they were Black Tartarians, so i bought five pounds. What was i thinking? The damn things are delicious, but they’re the size of the Montmorency variety, which meant that i spent all yesterday afternoon and part of the evening pitting the damn things and ended up with only a couple of liters. Talk about labors of love, but i just finished cooking them down with a quart of sugar, the pulp of an apple, and the juice of a lemon. Got eight 8 oz. jars. Whew. First come, first served. AAL – Apricot Jam. 5/22. Rodin Farms at the Castro Farmers’ Market had lovely apricots this afternoon, so i grabbed a bag. This one will be fine for the kiddies, as it contains nothing but 2 liters of apricots, a shredded apple, the juice of a lemon, and a quart of sugar. ANC – Apricot Nectarine Chutney. 5/24. To make up for that bland apricot jam the other day, here’s a chutney of mixed apricots and nectarines with a bright, shining level of capsaicin from 3 t. of New Mexico chile powder and a heaping tablespoon of Indian hot lime relish. Oh, and this one’s a bit “rustic” because i used some old dried-up prunes with pits instead of the usual raisins and thought i’d just let the nectarines pulp cook away from the pits. Well, i swear i did that successfully at some point in the past, but this time the pits didn’t just float cleanly to the surface for easy removal, so some jars will have a pit or two in them. RALC – Raspberry Jelly. 5/25. To this batch i added one level teaspoon of New Mexico chile powder, not enough to make it “hot” but just enough to brighten it up. You can barely taste the chile, i promise. But since i was getting fancy here i went ahead and substituted brown sugar for about 25% of the total sugar. A rich and complex jelly, if i say so myself. TCSU – Black Tartarian Cherry Jam with Sukhi’s Relish. 5/25. Pitting that last batch of Tartarians was so tedious that i’d thought i’d not do another, but this morning Alfieri had them again, and today they were much larger. So i couldn’t resist. And glad i didn’t because i was able to pit them in just a couple of hours. This batch i delicately flavored with a heaping teaspoon of Sukhi’s Hot Lime Relish, and while some people would taste a soupçon of oxymoron in the use of “delicately” with any of Sukhi’s products, i assure you that a single heaping teaspoonful simply adds a bit of complexity and “heat”. APAL – Aprium Jam. 5/31. 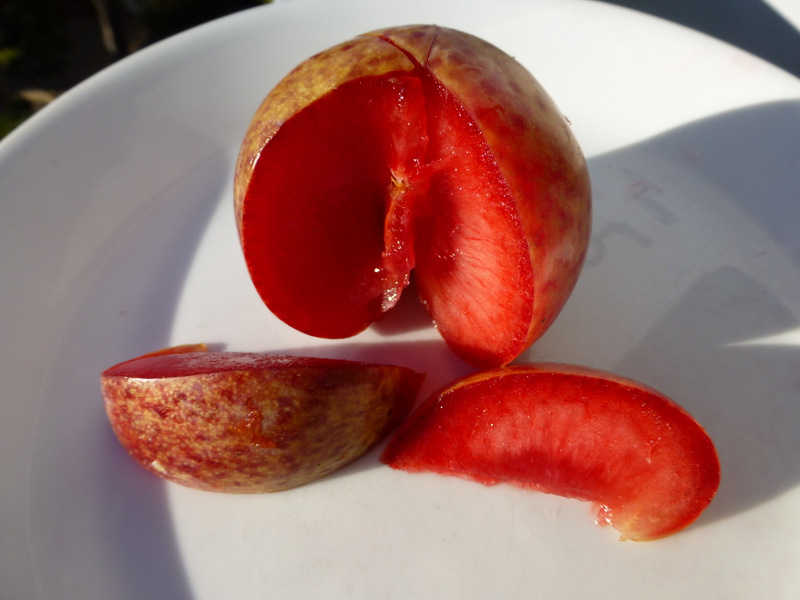 Yes, Aprium, an apricot/plum hybrid from Hamada. They look more like apricots but you can taste the plum influence. Quite nice. CPK – Cherry Jam flavored with Patak’s Hot Lime Relish. 6/1. I found handsome Bing cherries this morning at Alfieri’s at the Heart of the City Farmers’ Market and got 6 lbs. This preserve is a great favorite of several of my consumers, so to make sure, i went ahead and put in plenty of Patak’s, so it’s not for the shy. Pickled Wax Beans. 6/2, 6/9. I did these mainly for the color, as the yellow is a nice contrast with the usual green, but a fringe benefit turns out to be that they (at least from this vendor at the Heart of the City FM, this time) run a little shorter than the typical green bean, which means you don’t have to snap some off to get them to fit into jars. I flavored them with a dried Ahi chile, and i’m holding my breath that my supply of those dried chiles will last until the little Thai chiles begin to appear fresh in my markets. 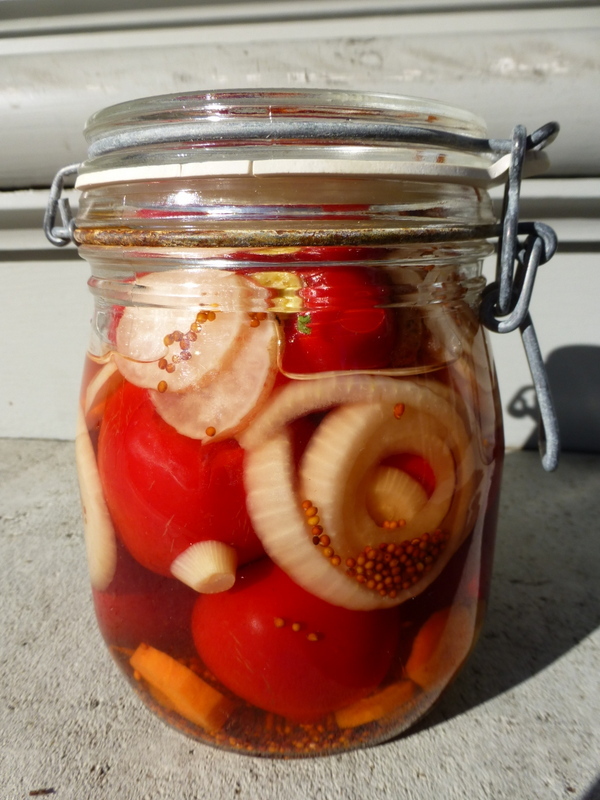 RCPK – Rainier Cherry Jam with Patak’s Hot Lime Relish. 6/4. I also did these at least partly for the color, and i went ahead and put lots of Patak’s in these. Not for children. TB – Tayberry Jelly. 6/4, 6/11. Yep, tayberry season is here, so to celebrate, a jelly with no exotic ingredients. Well, except that i used brown sugar for about a quarter of the total sugar. I mean, i have to do something different. NAL – Nectarine Jam. 6/5. Nectarines began appearing in our farmers’ markets a couple of weeks ago, but i waited to make jam until Marie at Rodin Farms (Castro Farmers’ Market) had her first ones. The previous ones i just gorged on. Nothing exotic in this first batch other than the substitution of brown sugar for a quarter of the total sugar. Gonna keep trying this until someone tells me to stop. NPK – Nectarine Jam with Patak’s Hot Lime Relish. 6/11. The cherry jam flavored with Patak’s has been such a crowd pleaser that i thought i’d try it with nectarines although i did hold back a bit on the quantity of the Patak’s. TBPK – Tayberry Jelly with Patak’s Hot Lime Relish. 6/12. Why not slip a little Patak’s into some tayberry jelly? Again, only a moderate amount so as not to overwhelm the berries. RBV – Raspberry Vinegar. 6/15 From the 5/14 jelly. BBPK – Blackberry Jelly with Patak’s Hot Lime Relish. 6/20. OK, after this one i may have to move on from the Patak’s for a while lest folk start thinking i stir it into my oatmeal. But it sure does add a pleasant little zip to jams and jellies. NALT – Nectarine Jam with six little yellow Thai chiles. 6/23. Pleasant warmth but not hot. BB – Blackberry Jelly. 6/25. Just plain old blackberry jelly. TBV – Tayberry Vinegar. 6/25. From the 6/04 jelly. CAL – Cherry Jam. 6/27. Couldn’t resist making one more batch of plain cherry jam since the season is virtually over. NALTT – Nectarine Jam with a dozen of those little yellow Thai chiles. 6/27 Sr. Yerena told me he could faintly detect the chiles in that NALT, so i upped the ante. PAL – Pluot Jam 7/6. Can’t let the season go by without making at least one jam out of pluots, and i spotted some handsome Dapple Fire variety at Alfieri. Cooked it way down, so it got pretty dark. Tasty, and the raw pluots are gorgeous. NTTT – Nectarine Jam with Fifteen Yellow Thai Chiles 7/6. Yow! Those chiles definitely come through in this one. Not for beginners. Tayberry Vinegar – 7/14. From the 6/11 tayberry jelly. BBJ – Blackberry Jalapeño Jelly 7/20 Three chopped chiles, seeds and all, gave this a pleasant chile tang without making it too hot. BBQN – Barbecued Nectarine Jam 7/25. Well, OK, i didn’t actually barbecue the nectarines but rather threw in a handful of chopped yellow Thai chiles and a Secret Ingredient. Not available at Safeway and perhaps pushing the exoticism, but hey, some folks are gonna love this one. RBT – Raspberry and Thai Chile Jelly 7/26. I picked up some mixed red and green Thai chiles this morning along with the raspberries and used 17 of them in the batch of jelly because they were quite small. The jelly turned out to be rather milder than i expected although you can taste the chiles. Blackberry Vinegar 7/26, From the 5/25 jelly. RBBJ – Raspberry-Blackberry Jelly with Jalapeños 7/30. A flat of raspberries from Yerena plus three baskets of blackberries from Morena, enlivened with some chiles but not at all “hot”. CRC – Confiture de Reines Claudes 8/1. Marie at Rodin Farms had the first of her greengage plums, so i made this jam of them. Click here for the full story. 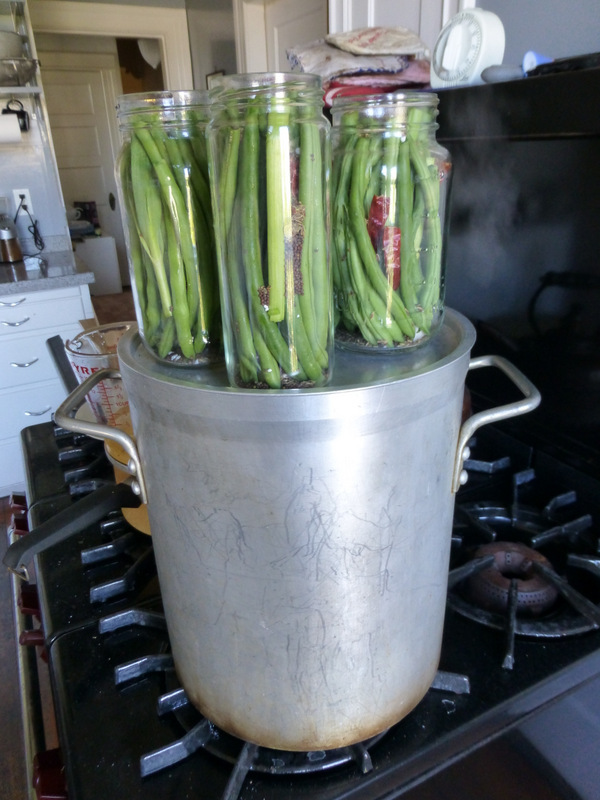 Pickled Jade Beans 8/4, 9/15, 9/29, 10/13.The Jade bean is a small green bean somewhat larger than the haricot vert but still small enough to look dainty. Unscrupulous vendors have been know to try to pass these off as true haricots verts. Some years ago i ran across a vendor who shall remain anonymous because he had a sign up, “Harris Coverts”. I got these from McGinnis, who compromise and call them “French Beans”. The last batch came from Dirty Girl and included some that were yellow. Never saw that before, and they’re cute as well as delicious. FPT – French Plum Jam with Thai Chiles. 8/5. The first of the “French Plums” from Marie at Rodin Farms. AKA Sugar Plums, but click here for details. BBC – Blackberry Jelly with New Mexico Chile Powder. 8/8. I got just enough chile powder into this to give it a mild chile flavor. Not hot. Pickled Brussels Sprouts. 8/8. I spotted really nice sprouts a couple of days ago. Thus these pickles. GJ – Greengage Jam. 8/9. I put in one Jalapeño that i seeded and deveined, so its barely detectable. RBTT – Raspberry Jelly with Thai Chiles. 8/10. OK, got enough Thai chiles into this one to taste. Still not very hot, though. RCE – Reine Claude Encore. 8/14. Marie had the last of her Reine Claudes (Greengage plums) so i made a final batch of jam. Brightened this one up with a dab of salsa and four Thai chiles…just enough to barely taste. NMB – Nectarine Mango Barbecue Jam . 8/16. The Barbecued Nectarine Jam went over so well that i made this one out of fruit i had on hand before i left town on my Portland trip. Oh, and some leftover barbecue sauce. Yeah, that was the Secret Ingredient in the Barbecued Nectarine Jam. Blackberry Jalapeño Vinegar 8/30. From the 7/20 jelly. Raspberry Thai Chile Vinegar 8/31. From the 7/26 jelly. NGAL – Niabell Grape Jam. 8/31, 9/7. Last year’s jam from these grapes was such a hit that i made it again this year….and got real close to caramelizing the first batch owing to watching the US Open, so it set like concrete. Fresh Cranberry Beans. 9/4. These are my favorite shell bean, and during their season i buy them from Busalacchi at the Heart of the City Farmers’ Market or from Iacopi at the Ferry Plaza Farmers’ Market. Iacopi has the highest quality, but Busalacchi is a lot cheaper. Once i get them home, i spread them out on newspaper on the kitchen floor for 24 hours, which relaxes them and makes them much easier to shell. Then i shell them, blanch them, and freeze them so i can serve them to guests throughout the winter, spring, and early summer. Well, those i don’t just cook and eat. 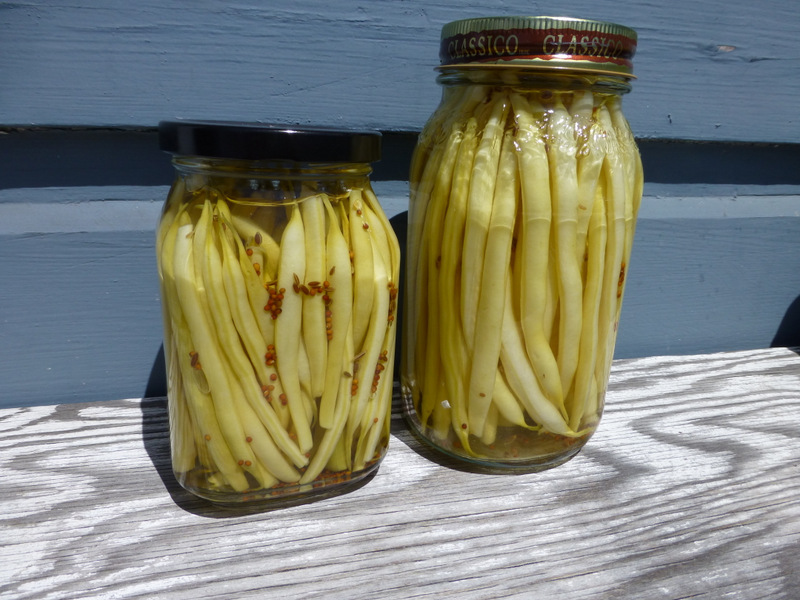 Pickled Yellow Romano beans. 9/5. 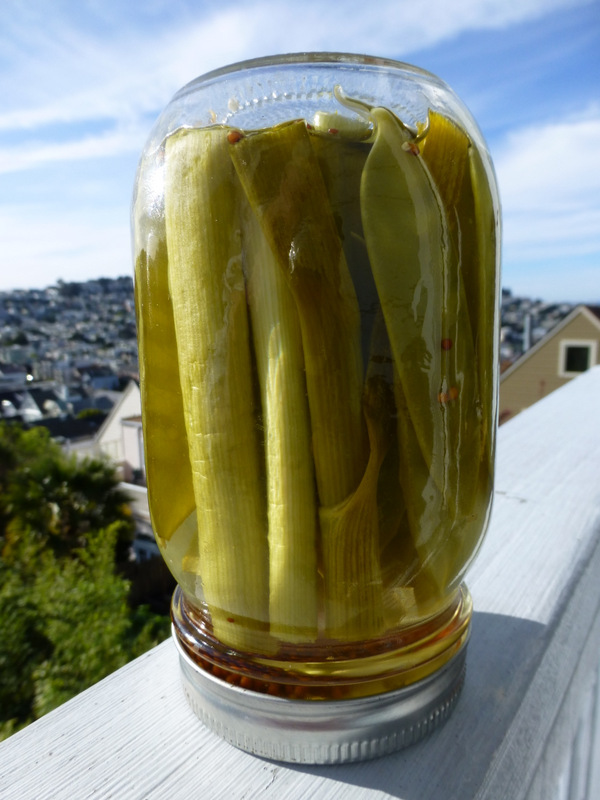 I’d never seen these beans until a couple of days ago at the Castro Farmers’ Market, so i bought enough to pickle four jars of ’em. FPTT – French Plum Jam with plenty of red Thai chiles. 9/6. I got the French Plums from Glenn Tanimoto at the Heart of the City Farmers’ Market and the Thai chiles from the Herrs at the Noe Valley Farmers’ Market. The chiles were big and red and oh, my, goodness i didn’t really need ten of ’em in this batch of jam. Vibrant chile flavor comes right through! BBQNT – Barbecued Nectarine Jam with red Thai chiles. 9/6. Another of the barbecued nectarine jams, and on this one i ramped it up with some Thai chiles. MC – Mango Chutney – 9/9. Mexican mangoes are in season, so i bought a box to make this classic treat. 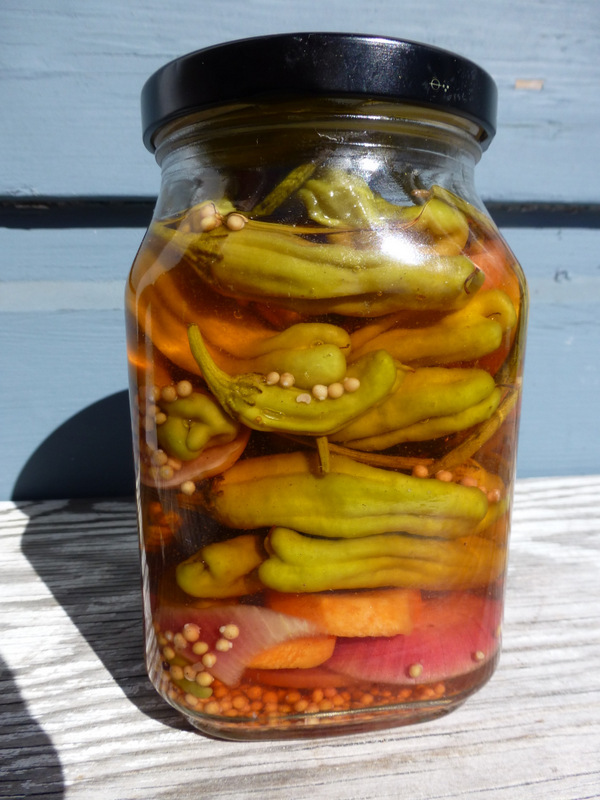 Pickled Pimentos de Padrón. 9/15. Padrón peppers are at the peak of their season now and the price is down. Thus, eight jars of ’em. PC – Peach Chutney. 9/19. Ok, in the spirit of full disclosure, this one is made mostly of yellow peaches but the batch also contained one mango and one nectarine because there were not quite enough peaches on hand. I also went ahead and in addition to the fenugreek, cardamom, cloves, cinnamon, California bay leaf, wild green fennel buds, ginger, and turmeric i threw in seven red Aji chiles. Five might have been enough. Sauteed Pimentos de Padrón. 9/21, 26, 28. Picked up some more Padrón peppers and tried sauteeing them in olive oil and dry packing them into hot jars. The jars sealed, but am unsure about how they’ll keep since they’re not acidic and could thus present a health hazard. What i’ll have to do is go ahead and refrigerate the jars when they cool off and suggest to folks that they keep them refrigerated. Damn shame i can’t mail them to friends, as they are just delicious this way. Locals, get your bids in! 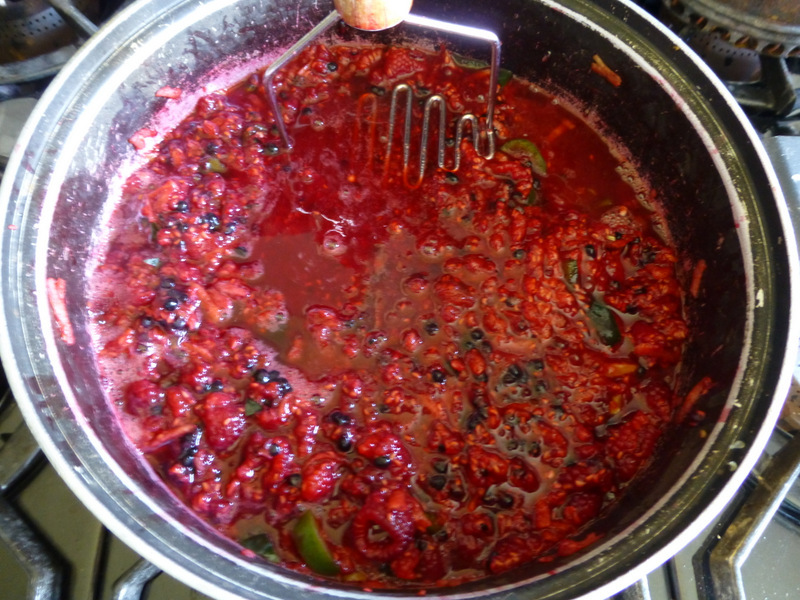 BBT – Blackberry Jelly with Thai Chiles. 9/26. I held back on the Thai chiles on this one, so it’s not too hot for most folks. SAL – Strawberry Jam. 9/27. Plain Strawberry Jam since i have three friends with kids whose favorite jam is Strawberry. WNC – White Nectarine Chutney. 9/27. Yep, from my regular chutney recipe but using white nectarines, which i never buy because i like the yellow ones so much better, but the yellow nectarine season is over, so i bought a bag of these to show some solidarity with my friend Marie at Rodin Farms. Went ahead and used up the rest of the Thai chiles in this one, but it’s not as hot as that Peach Chutney above. NGNM – Niabell Grape Jam with New Mexico Chiles. 9/28. The Hamadas still had Niabell grapes last Saturday, so i bought five pounds, and since the previous two batches of jam with these fabulous grapes were plain, i went ahead and chopped about ten red New Mexico chiles into this one. You can taste ’em, oh yes. 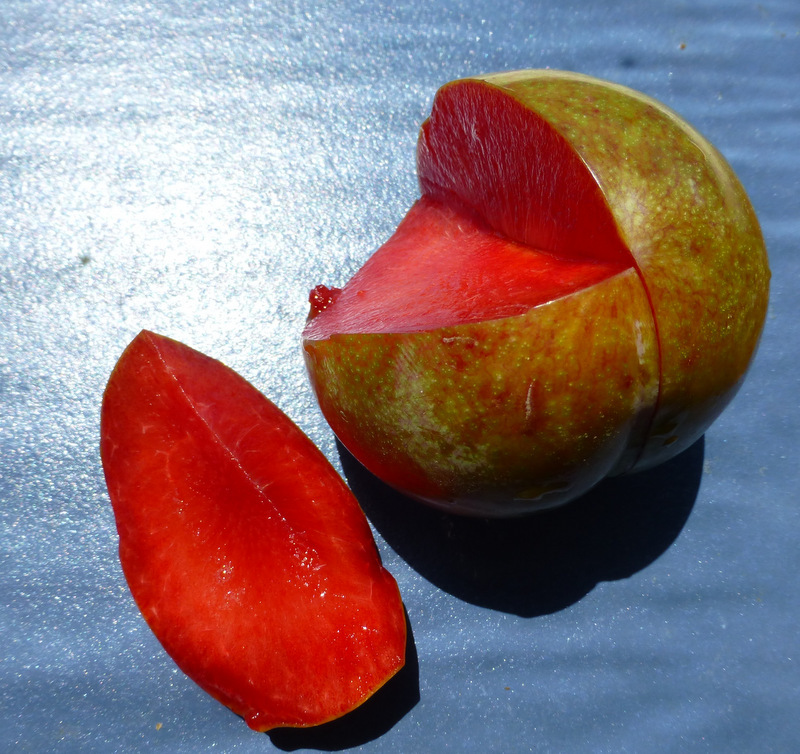 DDNM – Dapple Dandy Pluot Jam with New Mexico Chiles. 10/12. I got the Dapple Dandys from the Hamadas yesterday. I went out this gorgeous morning and the patented plug i’d stuck in a nail hole blew out when i was halfway across town and i was so exhausted by the time i got home that i collapsed into bed. Woke up and discovered that the gorgeous morning had turned into a roasting afternoon, so since i was trapped at home i figured i might as well spend the rest of the afternoon whimpering over a hot stove. And so as to share my pain, i went ahead and threw in lots of chiles. Here’s the Dapple Dandy. RLM – Rangpur Lime Marmalade. 10/20. Carol’s little tree had a bumper crop this year and she shared a big bag of the little delicacies. Thus this marmalade. That’s it for the 2014 season because i’m now packing for a move.